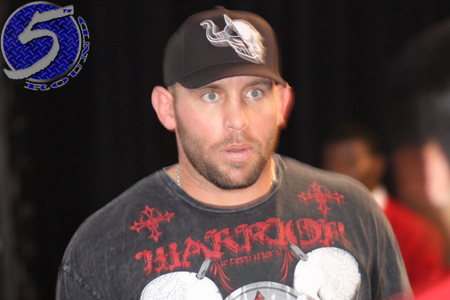 Shane Carwin’s (Pictured) banged up knee will not prevent the former interim heavyweight champ from facing Roy Nelson at “The Ultimate Fighter 16 Finale.” As expected, the opposing TUF coaches will collide inside The Joint at the Hard Rock Hotel in Las Vegas, Nevada. “Roy Nelson has gotten under Shane Carwin’s skin all season and Shane’s ready to try to knock him out,” UFC president Dana White said. “I don’t expect this one to go the distance. Roy and Shane were civil to each other on ‘TUF,’ but they can’t stand each other and after having to spend six weeks together, Shane said he can’t wait to knock Roy out. In addition to the 265-pound affair, five other scraps were confirmed. Mike Pyle vs. James Head, Nick Catone vs. T.J. Waldburger, Rustam Khabilov vs. Vinc Pichel, Reuben Duran vs. Hugo Viana and Johnny Bedford vs. Marcos Vinicius were all announced for the December 15th festivities. In addition, the two welterweight finalists from this season of the long-running reality series will battle for a six-figure UFC contract in the event. Tickets for the show go on sale next week. FX will broadcast the night’s featured fights live beginning at 9PM ET/6PM PT.